Launch on AWS from $0.00/hour. 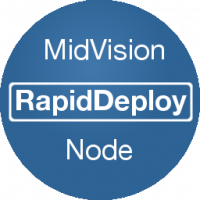 This AMI contains a ready-to-run MidVision RapidDeploy Edition image v5.0 on the AWS marketplace Linux. In order to use this image, you need to launch it with your selected type, and log in via SSH to configure RapidDeploy and start it. Comes in 10, 50, 100 and 250 target node AMI’s. The 10 target node AMI is free to use.